So the visionary painted another satellite map, showing what would be the outcome if we could substantially reduce the importance of the car in todays Cities. 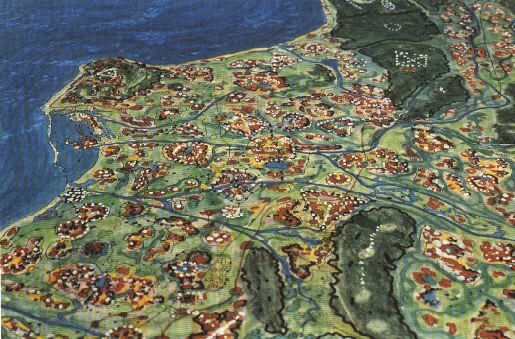 He showed a network of pedestrian oriented, clustered communities, born in a chaotic process of ìEdge City Densificationî, which in a way remind us much more of a European land use pattern with dedicated subcenters, which provide in short reach access to public transportation, shopping, services and all kind of leisure activities. It is the purpose of this speech to argue that the European land use pattern and the tradition of small, clustered community centers is the most suitable to the changing nature of work and life in the information society and therefore Europe is literally one hundred years ahead of the United States in terms of physical spatial development. Unfortunately, we might not see the benefit of this advantage, rather see our assets getting rotten and dying out. Development patterns in the information society have not yet completely overcome the industrial Schumpeterian myth that support accumulation, concentration and growth as the ultimate path to progress. Technology development is still done on assumptions of ìurbanî versus ìruralî, also in the field of telematics. It is a big progress if we might be able to link these two issues , the urban and the rural together. Usually, the point is made from the angle of rural areas, so I want to point out why the future of the city is in the villages.